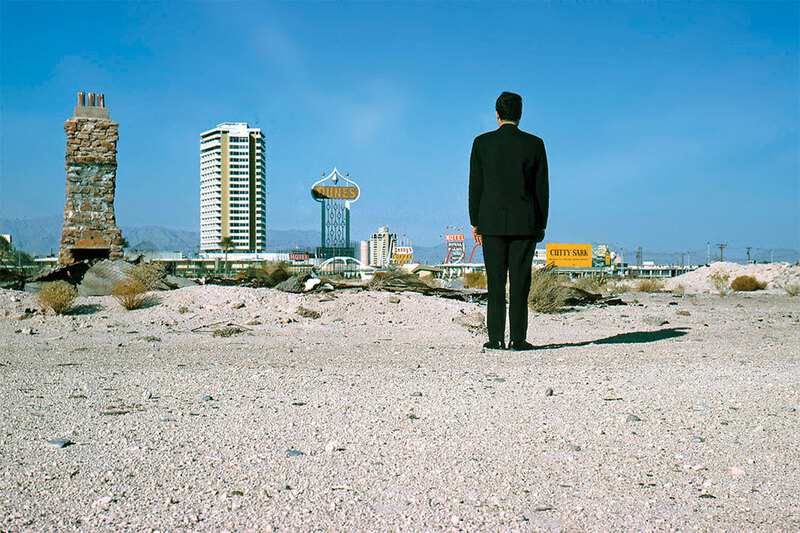 Robert Venturi outside Las Vegas, 1966. Photo: Denise Scott Brown. MY STUDENTS AND I were in the midst of studying Learning from Las Vegas when the news came of Robert Venturi’s death. 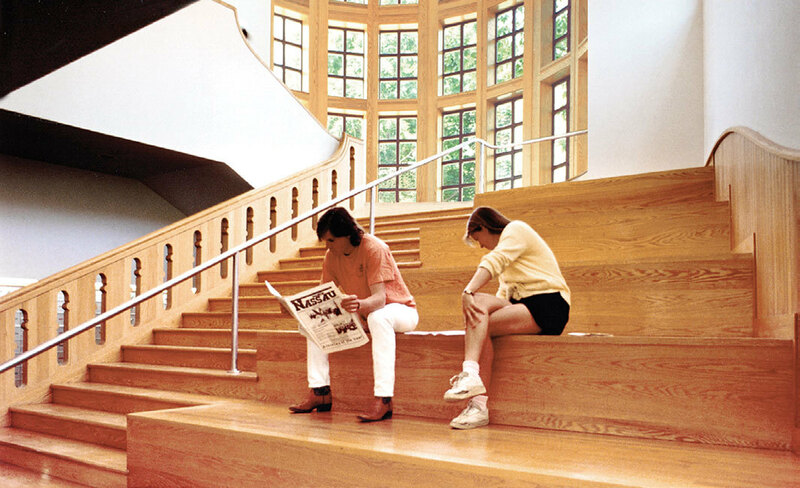 We had just absorbed an extraordinary lecture tour of his mother’s house, in all its faux–New England simplicity, which harbored so many allusive surprises; now the book, published in 1972, was revealing itself to be a profoundly American source for the cultural-studies movement whose genealogy we had for so long attributed to the Birmingham School. It also turns out to have been one of the underground blasts that signaled the beginning of postmodernism. The 2017 facsimile reprint of the original, with its fiery preface by his coauthor and collaborator Denise Scott Brown, reminded us that Venturi was not alone in this rediscovery of American culture in the desert, and that its vernacular was but one of two distinct languages he and Brown deployed to convey their revelations, the other being the scholarly subtlety and richly detailed historical argumentation of Venturi’s own Complexity and Contradiction in Architecture (1966): a book worthy of standing alongside so many volumes of rigorous New Critical literary analysis from the 1930s and ’40s, Venturi, here, drew on those volumes’ promotion of the irony and paradox of poetic language, prophetically modifying those terms in his title, a move that might tempt us to transform so many language games and figural antinomies back into more ominous Hegelian contradictions, while the term complexity, gradually replacing vitalism in the scientific languages to come, would grow into the buzzword of our present-day sciences (and computational practices). 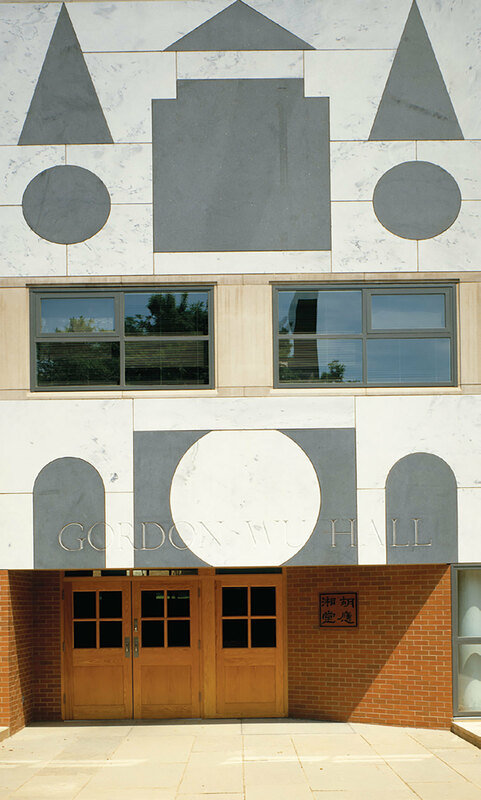 View of Venturi, Rauch, & Scott Brown and Associates’s Gordon Wu Hall, Butler College, Princeton University, 1983, Princeton, NJ. Photos: Mark Cohn. So here, in Venturi’s work of the ’60s and ’70s, we find a reconciliation between the two embattled sides of high and low, of aestheticism and populism, of the canon and television and pop-music studies, of elitism and the Simpsons’ couch: both ideologies and commitments flowing from the same source. The opposition formulated in Learning from Las Vegasthe distinction between the monumental duck and the decorated shedreinvented one of the most ancient quarrels in philosophy. Even the great intellectual event of those yearsthe theoretical revolutionwas already taking place in these two books and could be detected even more powerfully in the seemingly populist work than in the scholarly one. For I claim that the opposition formulated in Learning from Las Vegasthe distinction between the monumental “duck” and the “decorated shed”reinvented one of the most ancient quarrels in philosophy: point, line, and surface; city versus country; empiricism versus dialectics; Alexander Kluge’s “onslaught of the present against the rest of time”; the critique of totality; and, last but not least, that “autonomy of the work of art” that Adorno was always on about, and whose gradual fading from the scene in the other arts (but not in architecture!) seemed to some to herald the end of art, if not the end of history itself. 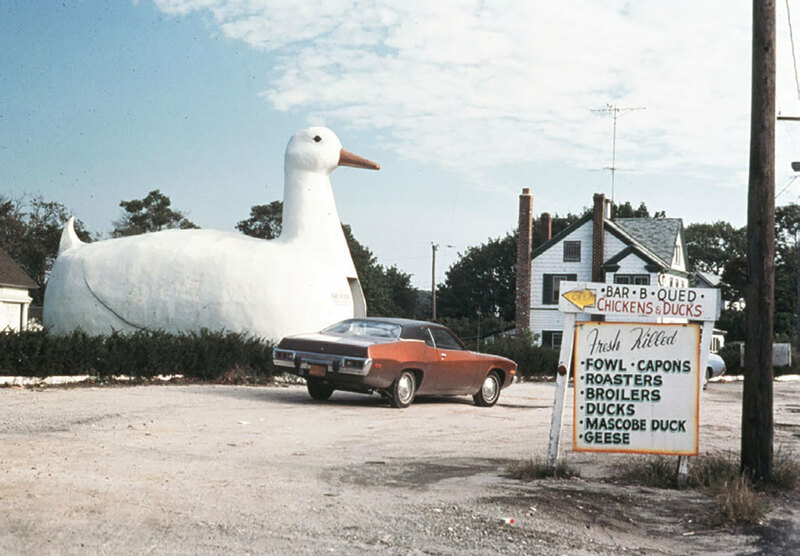 “The Big Duck,” Flanders, New York, 1970. Photo: Venturi, Scott Brown and Associates. The monumental duck in itself embodied the autonomy of art; like a subject of Barthes’s Mythologies, it proudly affirmed, I am architecture! I am the work of art! Like a sonnet of Mallarmé, it wrenched itself free of a surrounding fallen language, and on Corbusian pilotis denounced the very ground, its former body, in a well-nigh Hegelian drive toward pure spirituality, the Villa Savoye encircling itself, no longer visible or accessible, with a park, and drawing the dreaded motorcar and its worldly trajectories into its interior, where they were no longer visible and became part of art itself. Venturi and Brown’s denunciation of the duck was, to be sure, part of a polemic against pretentious and historicist architecture, monumental civil buildings and the like, but also against modernist “art buildings” (which are even more auto-referential than the traditional ones). This is the sense in which Learning from Las Vegas is a postmodernist manifesto. But it is also why, many years after reading it for the first time, I was astonished, as I visited Venturi, Rauch, & Scott Brown’s Gordon Wu Hall in Princeton, New Jersey, to see (and feel) the sumptuous elegance of the materials, the polished woods and metals, the gleaming surfaces of what is surely no longer the “cheapskate architecture” Frank Gehry was so proud of in his own house in Santa Monica, California. Venturi might well have called this display of the trappings of high art “irony”a New Critical category that squares the circle of the Vegas manifestoand let it serve as a wink at connoisseurs: You think we speak the language of the people, the strips, of commercial bad taste, but we’re really also high art, too! (We include a theory of high and low! We are reflexive as well as vernacular!) I doubt if Venturi’s polemical oppositionsUgly and Ordinary versus Heroic and Originalcan ever really be solved, not only because the defense of the popular tries to evade Bourdieu’s law of distinction (according to which every art pursues its own self-justification like a survival instinct), but even more because both sides are ideological, and you cannot get out of ideology. So it is that underneath Venturi and Brown’s extraordinary analysis of the decorated shed, Rome slowly appears in all its glory and monumentality. The facades of the great cathedrals move out to the street and become signs and ads of varying proportions (depending on the speed of the drivers); St. Peter’s vast square becomes a parking lot, the basilica a casino, and the side chapels so many dimly lit gambling salons under low ceilings. This is truly another form of historicism, the one we deserve; and it accommodates the theory. For the concept of the decorated shed explicitly tells us to do what we like with the space of the shed, to pray, sleep, give speeches, store our boxes, repair our cars: It is a form and not a content. Is it a structure, like Adam’s house in paradise? Perhaps, but then in that case, unlike the duck (where the ad or sign has been amalgamated with the monument itself), the structure is a tripartite one: the sign or facade, the parking lot, and then the basilica itself, the showcase or display space versus the back room (as Erving Goffman might have put it), where its unconscious, perhaps, or its hidden meanings (Freudian or ideological), its secret intentions or “programs,” live. 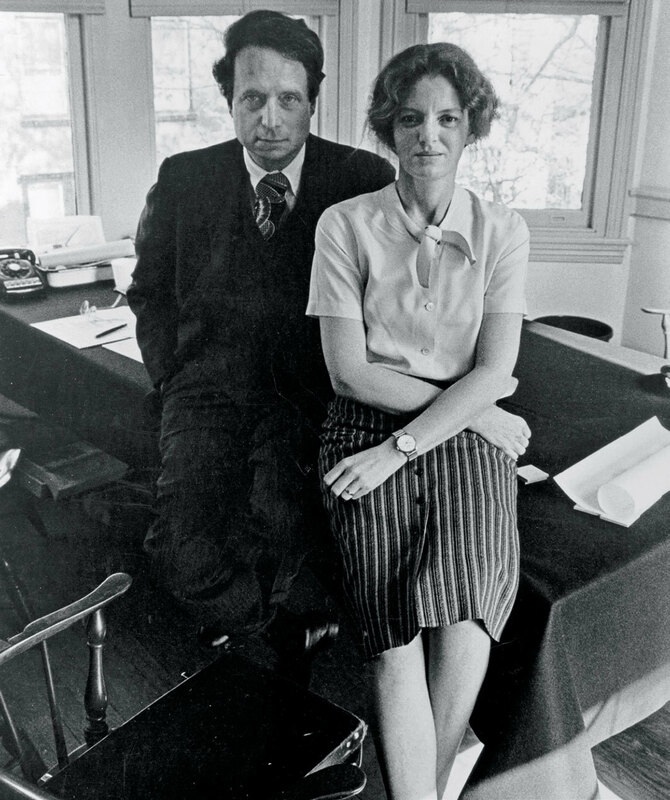 Robert Venturi and Denise Scott Brown in their first office, Pine Street, Philadelphia, ca. 1970s. Photo: George Pohl. There is much more to say about Venturi’s theory, but we must pause, if only to interrogate its other subject, hidden in plain sight, namely, the city itself, secreted away in the book’s title. The polemic (Ugly and Ordinary versus Heroic and Original) still turns on the individual building alone, and no doubt we could always appeal to structuralism and its linguistic codes and talk about the opposition between langue (the city as language) and parole (the building as utterance). But what happens in a really self-conscious or “artistic” architectureindeed, the kind of architecture the field seems to strive for today, in an era of congestion and overpopulation, of the crisis of the urbanis the transformation of the individual artifact, the building, into a whole city in its own right, a microcosm that seeks to match its macrocosm point by point and replace that totality that is, or was, the city with a scarcely less imposing and monumental totality of which the skyscraper was but the premonition: namely, the buildings of Rem Koolhaas and Zaha Hadid; Peter Eisenman’s Wexner Center for the Arts in Columbus, Ohio; or Gehry’s Guggenheim Bilbao. In short, the new megastructure of the postmodern (to which Gordon Wu Hall perhaps corresponds in Venturi’s oeuvre): the duck as shed, the shed as an advertisement for itself. This theoretical side of Venturi and Brown was, I think, less obvious to observersfollowers and critics alikethan the populism of which Learning from Las Vegas (both as material book and intellectual content) was the manifesto. Maybe they preferred it that way; it would have been very American of them. 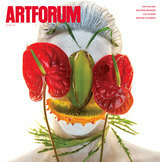 In that, too, as a unique conjunction of theory and practice in American art, Venturi belongs to American as well as architectural history. Fredric R. Jameson is Knut Schmidt-Nielsen Professor of Comparative Literature at Duke University.